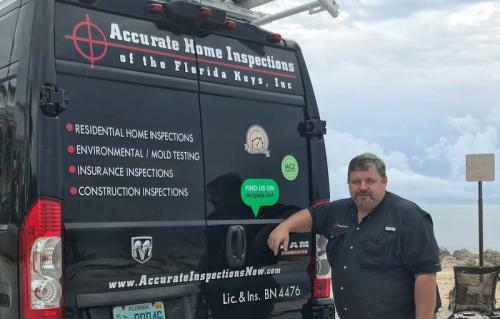 About Your Inspector | ACCURATE HOME INSPECTIONS of the FLORIDA KEYS, Inc.
My name is Douglas Mudge and I am the owner of Accurate Home Inspections, centrally located in Marathon, Florida; and serving the Florida Keys, from Key Largo to Key West. We are proud to be members of The Independent Home Inspectors of North America association. What does this mean for the consumer? It means, our company is completely unbias, our only goal is to provide the Client with a full and honest assesment of the property they are interested in. To avoid any perception of interest conflict, we do not market our business to Real Estate offices and we do not pay referral fees to Realtor's or their Brokers. That is one reason you may not find us on your Realtor's list of preferred inspectors, the second reason is because we are more thorough than most inspectors. Some Realtor's may even try to discourage you from using a Home Inspector that is not on their "approved list". Rest assured in the State of Florida you may choose whom ever you feel most comfortable with. For more information and to better guide you in your selection of a Home Inspector, go to: "http://www.independentinspectors.org/florida"
I am a Certified Master Inspector, (meaning we have completed thousands of hours both in education and in performing inspections.) We are the only Master Certified Inspector located in the Florida Keys. We are one of the few Home Inspection Companies in the Florida Keys with a A+ Rating on the famous Angie's list and for three years in a row have won Angie's Super service award as a Florida home inspector. (Angie's list is a referral service that helps home owners / buyers find good contractors.) Our goal is to keep that rating through good service and fair pricing to our clients. We invite you to go on the Angie's list website and read some of the reviews our previous clients have posted. Our company provides honest, objective, and thorough inspection reports in electronic format 24-48 hours after reciept of payment. Each report is easy to read and customized to your home, you wont find items like basements or boilers in the report unless your home has one. From the first contact with us through the inspection delivery and explanation of your report, you will experience the ultimate in professionalism. A large percentage of our business comes from referrals or word of mouth advertising. Because we are not building contractors looking for fill in work, the report will be Accurate, not exaggerated. You will not see an estimate attached to our report. We do not offer any repair services, as that is illegal and unethical in the state of Florida and we do not refer contractors to our clients as that too, can be construed as unethical. We only suggest that our clients contact at least three licensed qualified contractors for an estimate before hiring anyone to do repair work that may need to be completed. We are one of the few, truly independent home inspection companies in the Keys.